Today is the last post in a series about mealtime traditions. With four young kids, mealtime behavior can be a challenge. At any given meal, it’s likely that Karis is having a meltdown over her bowl being the wrong color. Kembe and Jafta are likely kicking each other under the table. India is probably crying, LOUDLY, because a vegetable was placed on her plate. Jafta is probably overstuffing his mouth like he’s a contestant on Survivor. Kembe is likely bouncing in his chair and chewing with his mouth wide open. And Mark and I are likely looking at each other from across the table, rolling our eyes and reaching for a glass of wine before we send someone to their room for misbehavior. Remember the mealtime scene from The Miracle Worker? It feels a little bit like that. Only there are four of them. I finally found a solution to keep behavior in check during mealtimes and it’s shockingly simple. When we start our meal, we usually have a quick prayer and then light some candles for anyone we are concerned about. At the same time, we also light a smaller candle that we refer to as the “Manners Candle”. 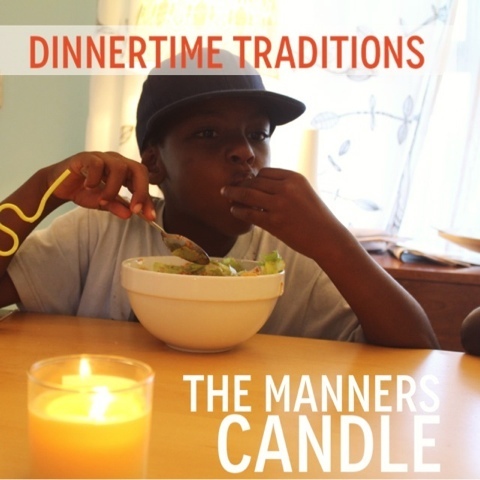 It’s a pretty easy concept: the candle stays lit as long as they are using appropriate table manners. If someone gets unruly, the candle is blown out. There are no rewards involved. There is no punished doled out to the person who cause the candle to be snuffed. But my kids are really, really motivated to keep that thing lit. 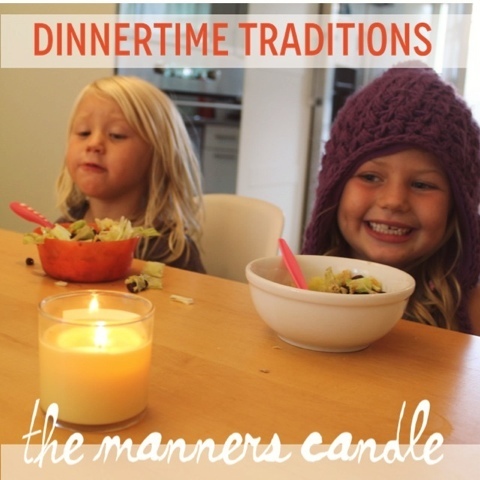 The difference in behavior when the “manners candle” is lit is amazing. I think the combination between wanting to win, combined with the social pressure and competition of not wanting to be the cause of it going out, makes this work well for my kids. How do you encourage good behavior during family meals?